At Christmas Farms, we understand the hesitation and even reluctance some people may have on ordering a tree for delivery, along with wreaths, garland and swag we also offer at our Premium Christmas Wreaths website. But we also hear of the satisfaction and joy that our customers express to us when receiving their trees and holiday greenery. So for you doubters out there, we’ve put together some of the questions and comments we get as the holiday season approaches. I would feel guilty having my Christmas tree delivered rather than going out and picking it myself. It seems too easy. You think Christmas is easy? The Christmas season brings a lot of wonderful and beautiful traditions to the holidays, but being easy isn’t one of them. In fact, the holiday season is too often a season of stress between shopping, decorating, office parties, more shopping, family get-togethers, last-minute shopping, cooking, gift-return lines…. Maybe the best thing you can do for yourself and your family for the holidays is to make things a little easier by having your Christmas tree delivered to your front door. But doesn’t it take a long time to deliver a tree? I want my tree to be fresh. Do you know when those Christmas trees on your neighborhood lot were cut down? Just after Halloween. 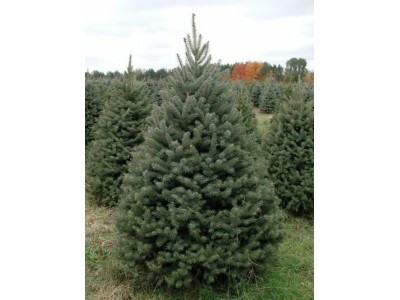 When you order a tree from Christmas Farms, we cut your tree just before we package it up and give it to UPS to deliver. In most cases, your tree reaches you in 2-5 days. If you’re near the Great Lakes, your tree can be there in as little as a day. You can even call us early and pick the day you want it delivered, and we’ll meet that date. How do I know what I’m getting when I order online or on the phone? I’d like to have a selection of trees to choose from. We like choices, too. But when you buy t from a lot or from a store, you’re likely to be choosing from only one or two varieties. At Christmas Farms, we give you a selection of eight varieties and post a tree comparison chart of color, shape, fragrance, needle retention, and the strength of branches from which to hang ornaments. You pick the variety you want, and even the size, and you will shortly have a beautiful tree that perfectly suits your home. You know, this all sounds great. But I’d still like to come to your farm and pick my own tree. You’re welcome to come. Many people do, and they have great time. If you live in Michigan, or will be visiting the state, our main location is at Tall Timbers Tree Farms, 55051 70th Street, Hartford, MI. Call us at 269-463-5750 or see the Tall Timbers Tree Farm website for more information.